Whether it’s fizzy, chilled, frozen or in a modified atmosphere, food and drinks will look and taste fresher for longer with Coregas’ range of specialised food-grade gases. We developed our expertise over 20 years assisting a range of customers to increase productivity and improve yields while maintaining high food quality and safety. The resulting range includes food grade gases and gas mixtures specially developed to suit most applications. All our food grade gases satisfy the highest quality standards and meet legal provisions on food required by the Australian Food Code Standard. The key food grade gases used by the food and beverage industry are carbon dioxide, nitrogen and oxygen. Coregas supplies food grade versions of the three individual gases plus various mixtures of the three, each specially formulated for different processes. Below are the most common applications of gases Coregas supplies to the food and beverage industry, but it is not an exhaustive list. For instance, other applications include sparging and blanketing. To discuss your specific application, speak to your local representative, complete our contact form or call our friendly customer service team. Freezing and chilling both extend the shelf-life of a huge range of foods such as meat, seafood, dairy, bakery, fruit, vegetables, ready-made foods and freeze-dried products. Reducing temperature works to slow the growth of bacteria: the cooler the temperature, the slower bacteria will grow and the longer the food remains fresh. Carbon Dioxide Food Grade and Nitrogen Food Grade are available as cryogenic liquids to enable fast freezing, which retains natural flavours whilst still improving shelf-life and processing times. They are also both ideal to regulate temperature during transport of chilled or frozen goods. Carbon Dioxide Food Grade is also use for cooling during mixing processes. Controlling the gases surrounding food in packaging and in storage is another important method of extending the shelf-life of food, often more than doubling the period in which it is safe to consume. When the MAP and chilling or freezing are used in combination, some products can remain consumable for long periods. For many foodstuffs, reducing oxygen levels in packaging by replacing it with carbon dioxide or nitrogen inhibits the growth of organisms that require oxygen to thrive, eg aerobic bacteria and mould. Conversely, meat requires a high level of oxygen to maintain its red colouring and some vegetables also need high oxygen concentrations to ‘breathe’. Many of our food grade gases have packaging or storage applications, including Carbon Dioxide Food Grade, Nitrogen Food Grade and some of the Corebrew mixtures. MAP Oxygen 70/30 – an oxygen-carbon dioxide mixture – is ideal for meat packaging. 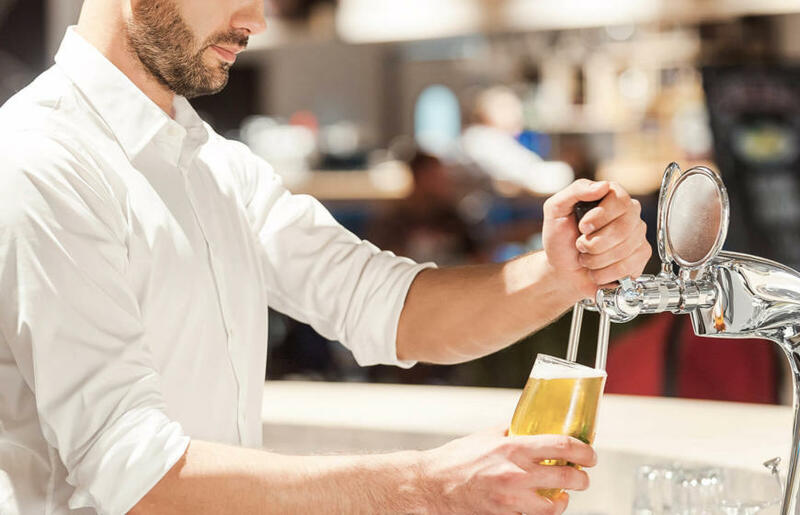 Food grade carbon dioxide – also known as post mix gas in the hospitality industry – is the gas used to put the fizz into ciders, soft drinks and other carbonated beverages. The post mix machine first mixes carbon dioxide under pressure with water at a controlled temperature, before adding syrup, sweeteners and other ingredients to make the finished drink ready for dispensing. Getting the right head on beer is an art, but there are ways to simplify things. Our range of Corebrew mixtures is specially formulated for dispensing different types of beers so all you have to concentrate on is perfecting your art. All beers naturally contain a certain level of carbon dioxide from the brewing process – the as brewed level – which is usually quoted in volume or grams per litre. The brewer deliberately selects this level, balancing its effects on the taste and appearance of the beer. The perfect gas mix will maintain that balance: the carbon dioxide component helps maintain the as brewed volume of carbon dioxide, whilst the nitrogen component helps to provide the pressure necessary to dispense it.